Work has been particularly punishing the past couple of days and my health has not been cooperative. I encountered an interesting read on Yahoo the other day, regarding this particular book. It would have been a creative title, had the book been published before Freakonomics. 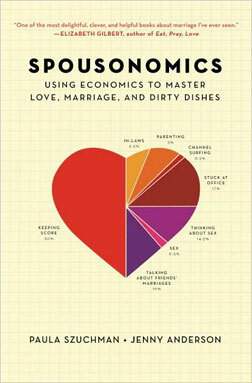 Still, it is an interesting concept — the use of economics in marriage. One of the theories proffered is that couples should not divide chores equally. Instead, one has to do what one is good at: specialization to increase productivity. In the case of this household, it’s more of I do the chores because I’m here. If no one is here, then the chores won’t get done. There is also the I hate frying so please fix dinner. There are a thousand ways to divide the tasks and we’re still getting the hang of it.